EB Acoustics EB2 review | What Hi-Fi? 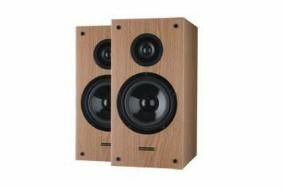 EB Acoustics sells speakers solely from its own website*. The company did offer just the one model, the EB1. They are now joined by the EB2s. Blown away as we were by the EB1s, we had high hopes when we first laid ears on the EB2s – and we weren't disappointed. Now, with the all-conquering ATC SCM 11s on hand, we want to find out just how good the EB2s are. These are big, standmount speakers, 45cm tall and nearly 30cm deep (more with the grilles on). The look and design may remind you of speakers past, but the composite wood-material cabinet is up-to-date compared with all those MDF cabinets in shops. The sealed, biwirable cabinet has a 17cm paper mid/bass driver and a soft-dome tweeter. But you won't need your eyes open to really understand what the fuss is about. Listening to Saint-Saëns' Le Carnaval des Animaux: Le Cygne drift through the EB2s could cure the fiercest of headaches, with the cello and two pianos articulated sublimely smoothly. Every subtle inflection is revealed by a staggeringly delicate, clean and transparent delivery. A listen to Foals' Spanish Sahara allows us to enjoy the EB2s' midrange with vocals, and it's an unnervingly immediate and emotive experience, the singer's voice given plenty of space to breathe despite being integrated effortlessly to the rest of the track. Spot-on timing makes for a driving, thigh-slapping experience when the music demands it. That speed is helped by bass notes that prefer agility and communication over room-shaking weight. Dynamics, punch, subtlety and speed, the EB2s have all the necessary skills to the utmost degree. They're unforgiving of rough recordings at high volumes; but is that really a weakness? After our first hearing of the EB2s, we couldn't wait to test them against a truly classic set of speakers. To say they've passed with flying colours would be an understatement.